Nearly 300 students gathered at Grand Canyon University Saturday to work together to revitalize the community. 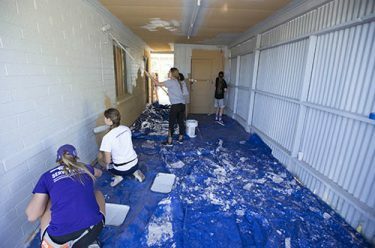 Nearly 300 Grand Canyon University students who might otherwise have spent their Saturday morning sleeping chose instead to pick up paintbrushes, shovels, wheelbarrows and rollers and spend the day toiling for their neighbors in the Serve the City neighborhood revitalization event. 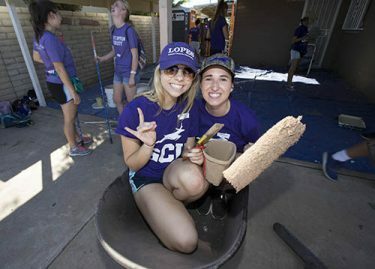 GCU’s semiannual Serve the City Day is part of the largest Habitat for Humanity partnership in the country in which University volunteers hope to renovate as many as 700 homes in their community. On Saturday, Habitat for Humanity President Jason Barlow encouraged the volunteers to make their work count. The students were joyful as music played, landscapes reformed and homes transformed as a result of their labor. 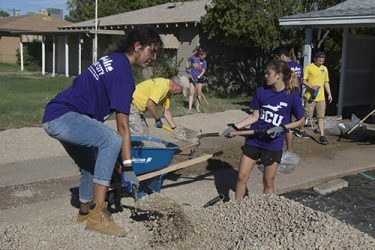 Volunteers lavished attention on seven homes and Bourgade Catholic High School and made a difference in the lives of GCU’s neighbors. Students picked up paintbrushes and rollers to give seven homes a new face. Habitat for Humanity volunteer Lee Bemis said many of the other homes were also decades-old, meaning the revitalization effort was extra beneficial to the Phoenix community. A half mile away from campus, at Bourgade Catholic High School, students and staff from GCU and Bourgade gave the school grounds a makeover and moved sprinklers away from a new security fence installed around campus. Students were all in about getting their hands dirty. Music played as students dragged old sod, carried rocks and dug through dirt. Even with sweat dripping off of their faces, they smiled and encouraged one another. It was a special sight for many students to also see GCU’s dean of students and pastor Dr. Tim Griffin (dressed in cargo shorts and a purple T-shirt) and President Brian Mueller (in jeans and a long-sleeved shirt) sharing the experience. On the north side of GCU’s campus, senior Paulina Awuah and some of her GCU Circle K International Club members were part of the landscape crew. The Lopes had much to smile about after a day of serving their community. Freshman roommates Madeline Lindey and Madison Lawson had a dance-off while painting. As it turned out, the students were celebrating their manual labor. Throughout the productive service day, junior Kyle Hammond said he wasn’t surprised by the positive atmosphere the students carried on. “I think we all understand the meaning of wanting to give back to a community that has blessed us,” he said. For a slideshow on this inspirational event, click here.